Orange team members (from left Andrew Sant Fournier, Nick Xuereb, Sophie Diacono, Emma Xuereb and Emma Gatt receiving the Excellence in IT award from the judge. Orange developed SelFeed, a freely downloadable mobile app where users are eligible for a discount on their bill at affiliated restaurants after sharing a photo (or selfie) of their purchase on social media. 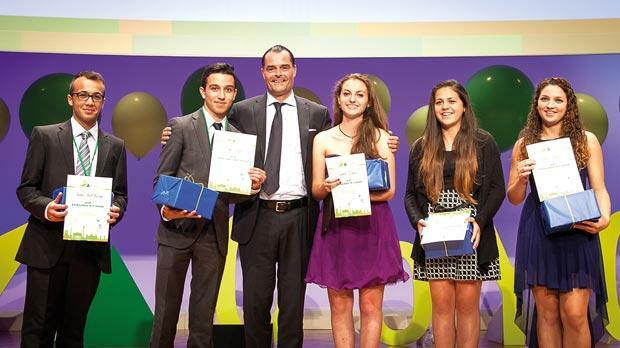 The JA-YE Malta’s flagship programme has been offered to first year sixth form students for 27 years. Since its start, the JA Europe Company Programme has equipped over 3.5 million students across Europe with the right skills to start up or become gainfully employed. Research has shown that alumni of the Company Programme are more likely to start their own business and have a higher average income than their counterparts. “The students showed their ability to identify a need, assess the potential and develop a product that is appealing to the masses, financially viable and scalable beyond our local shores. “It is the essence of what we do at JA-YE Malta together with our trusted volunteers, schools and teachers, sponsors and business partners. Through our educational programmes in primary, post-secondary and tertiary level, we are equipping youths to take better charge of their career prospects by means of fun, practical experiences in business that instil key entrepreneurship skills,” said Julian Azzopardi, CEO of JA-YE Malta.